Stire & Lyon, Toys, Dolls and Fancy Goods Featuring George C. Whitney Lace Valentines, Valentine Envelopes, Comic Valentines etc. mid18880s. ..
4 pp. wrapper. The trade catalogue is produced by Stirn & Lyon, Importers and Commission Merchants, Toys, Dolls and Fancy Goods, No. 16-20 Park Place, NYC. n.d. mid 1880s. Content includes Valentines and Envelopes manufactured by George C. Whitney, Worcester MA., featuring Lace Valtines by the dozens with two illustrations and numerous narrative descriptions with size and pricing information includes. Also includes Valentine Envelopes, Comic Valentines including Long Jokers, Fault Finders, "Hit 'em Hards", Sharp Dartsd, Trade's and Ordinary (which I thought were published by MCloughin...hmm?) Final page is Assortments for convenience at $6, $10 and $20, each with Show cards. Stamp on cover indicated 50 & 10% Discounts on this List, except for Comics -- 10 % only. Measures 7 1/2" x 5".. Corner chips on cover; generalized light wear. A 4pp circular featuring images, narrative and pricing information on the Self-Generating Gas Blow-Pipe Lamp, Bush's Wheel Protector, Roller Remover, Ruby Pin Adjuster, Movement and Fan Washrs, Material Cup, Pivot Wire and Case Spring Extractor. For sale at Goddard, Hill & Co. Jewelry. Pittsburgh, PA. Measures 8 1/2"x 5 1/2". Letterfolds. 36pp. wraps. A pun by the owner titles the catalog a "dummy" salesman. The inside cover includes "Our Policy"
First - To be Reliable, always. Second - Good Service. It's to our mutual advantage. Third - Dependable Merchandise, at one printed price. An extensive array of products ranging from sewing notions, to garter supports, shoe laces, stationery, veiling and slip-pon veils, Winsor Ties, Corset Laces and Linen Thread. Includes brief narrative description and pricing images. Images from photographs and illustrations periodically found in-text. Index inside back cover. Measures 8 1/2" x 5 3/4"..
314 page book, with gilt stamped covers, 1st edition. The book compiles forty-three (43) letters between an architect and his friends. These letters "are composed of hints and suggestions relating to to building of homes... [and] aim to give practical information to those about to build." This book is a wonderful piece of early architectural Americana style known as ‘Stick Style.’ This book features 30 black and white illustrations, some of which are full page blue prints to houses or rooms described in the letters. The list of illustrations has two pictures entitled 'On a Sidehill' and 'Only One Corner', supposedly printed on pages 43 and 48 respectively. However, this is not the case, they are located earlier in the book, one opposite the title page and the other right before the first letter begins. All the other illustrations are located where they are supposed to be. . Minor edge wear, particularly on the spine. Minor foxing. 24 pp (including covers) bathing suit catalog. The catalog proudly declares "It was the U. S. which originated the rubber swim suit. It was the U. S. which brought it to unrivaled perfection. That is why U. S. leads every year in rubber swim suit sales. And that is why U. S. leads again this season with the most outstanding styles and interesting innovations ever seen in waterwear." 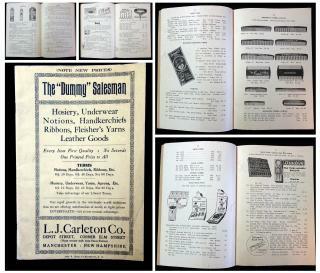 The catalog features a variety of items, from bathing suits for both men and women, to swim caps, and 'bathing' shoes. 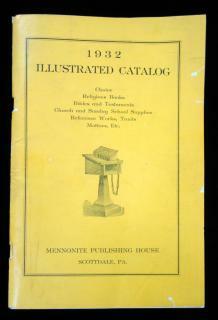 The catalog is full of black and white photographs depicting the items. Some of the images have blue coloring added to the clothing item to make it visually stand out. Measures 11" x 8 1/2". Minor edge wear. Toning and soiling due to age. Minor penciling (mostly check marks by items), though a name is written on the front cover. An unpaginated chromolithograph label catalogs beginning with explanations on Blank Lables and Lettered Labels followed by prices per 1000 labels by product number. Followed by information on Labels in Color --"Special Designs". The remainder of the catalogue provides different design. Measures 4 3/4" x 7".. Excessive cover wear; back cover lacking. Water stains title pages; some cuts. Selling content, not appearance. 53 pp. wraps. Narrative text with full page and in-text illustrations and graphs throughout. The globe is the Telechron Motored Electric Uniclok. It provided accurate time throughout the world with the aid of an electric lamp socket. Primary content Uniclok Globe Directions, The Earth (numerous sections), Demonstrating with Uniclok Time Dial & Globe, The Moon, The Sun, The Zodiac and Zodiacal Constellations, Questions and Answers, Different Models and Information. Measures 7 1/2" x 5". .
An unpaginated chromolithograph label catalogs beginning with explanations on Blank Lables and Lettered Labels followed by prices per 1000 labels by product number. Followed by information on Labels in Color --"Special Designs". The remainder of the catalogue provides different design. Measures 4 3/4" x 6 3/4".. Cover wear; some cuts. A 6 1/2" x 3 1/2" leather folio with marbled gusseted pocket on inside cover with fold-out linen backed catalogue with gilt stamp C. D. Edwards, Montreal on front cover. It depicts 27 different models of safes. They include single and folding door fire proof safes, Permutation Dial and Register Key Bank Locks and Fire and Burglar-proof Combined.Each model with a view of the interior, brief description including dimensions and price. The reverse of the page is blank. Measures 16 1/4" x 24" when open flat..